Parks was born in Fort Scott, Kansas, the son of a dirt farmer and the youngest of 15 children. He left home when he was 16, shortly after his mother's death. After an unhappy attempt to move in with a married sister in Minneapolis, Minnesota, Parks ended up spending a frigid winter homeless, an experience that sensitized him to the plight of the poor and that he would draw on in later photography and films. At the time, his hunger and loneliness nearly led him to a life of crime; however, he managed to struggle through high school, working odd jobs herding cattle, carrying bricks, and even touring with a semiprofessional basketball team. Working as a waiter on the Northern Pacific Railroad, Parks saw magazine photos produced by the Farm Security Administration, a federally funded project that chronicled the Great Depression in rural and urban America. Later, after watching a World War II newsreel by documentary filmmaker Norman Alley, Parks resolved to become a photographer. Based in Saint Paul, Minnesota, the self-taught Parks immediately showed an original eye for his subjects, although at the time he lacked the technical training to capture them flawlessly. Once, after finally getting the big break of a fashion shoot, he double-exposed all but one photo. Yet even the results of these mishaps captivated his viewers, and Parks soon had established himself as a much-in-demand fashion photographer in Saint Paul. His work eventually was discovered by Marva Louis, the wife of boxer Joe Louis. Marva helped him set up shop as a fashion photographer in the bigger market of Chicago, Illinois. In his spare time, Parks turned his camera from the fantasy world of fashion to the destitute streets of Chicago's South Side. These pictures, exhibited at the South Side Community Art Center, won him a Julius Rosenwald Fellowship in 1941 and an opportunity to work at the Farm Security Administration, where he took on the assignment of showing the "face of America." Under the tutelage of Roy Stryker, the director of the staff photographers, Parks found that he could express himself more powerfully with the camera than with words. "I learned that photography would enable me to show what was right and wrong about America, the world and life," he said. With the closing of the Farm Security Administration, Parks went to work at the Office of War Information in 1943, then for the Standard Oil Company of New Jersey as a documentary photographer. Continuing his work in fashion photography, he published two books, Flash Photography (1947) and Camera Portraits: The Techniques and Principles of Documentary Portraiture (1948). In 1948 Parks was hired by Life magazine, then one of America's leading pictorial publications, and spent two years based in Paris, France. His work in the United States in the 1950s and early 1960s and a highly acclaimed series on the slums of Rio de Janeiro, Brazil, won Parks international recognition as a photojournalist. His photographs in the United States dealt with many arenas, from politics to entertainment to the daily routines of ordinary men and women. Particularly noteworthy were his chronicles of the political activities of African Americans: the Civil Rights Movement (later collected into the 1971 anthology Born Black), Black Power in the United States, and the growth of the Nation of Islam. With photographs driven by a strong sense of narrative, it is no surprise that Parks found another calling in writing. In 1963 he published The Learning Tree, the saga of a 1920s farm family very much like Parks's own. 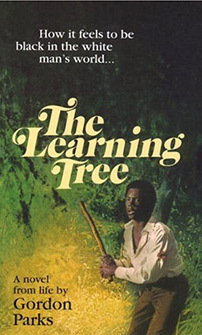 The Learning Tree was the first in a trilogy of autobiographical novels that was completed by A Choice of Weapons (1966) and To Smile in Autumn, A Memoir (1979). Parks combined his literary and visual talents in a 1969 movie version of The Learning Tree, becoming the first African American director of a major Hollywood movie. His hit movie Shaft, often cited as a forerunner of the blaxploitation film genre, was released in 1971, followed by Leadbelly (1976) and The Odyssey of Solomon Northup (1984), the story of a free black person sold into slavery. Parks was also a poet and composer, and he wrote the music for a ballet about the life of Martin Luther King Jr. Parks received the Spingarn Medal from the National Association for the Advancement of Colored People (NAACP) in 1972 and the National Medal for the Arts in 1986. He is the father of the late filmmaker Gordon Parks Jr., whose credits include Super Fly (1972).